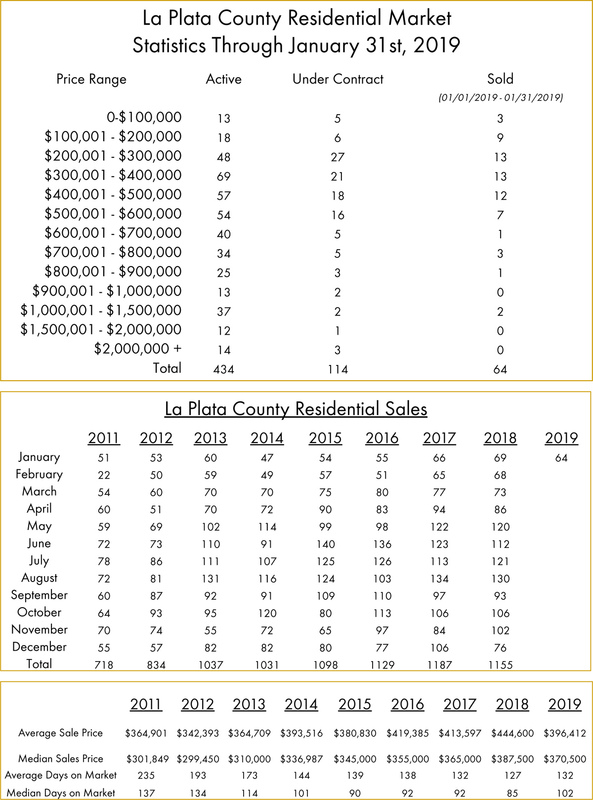 This week we have the La Plata County residential real estate transaction numbers for the month of January. With 64 total sales, it was slightly lower than the totals we saw for the last couple of Januaries; however, the differences are minor. January tends to be one of the slower months of the year, so it will take a handful of months before we see a trend to gauge the pacing of 2019 real estate. The median sales price is $370,500, which is lower than the 2018 year-end, but time will tell if that gap will diminish. The average days on the market was 132—slightly higher than 2018, but still remarkably low compared to several of the past years. Nationally, we have seen mortgage rates increase in the last year. However, last week they fell to the lowest since April 2018 (https://www.nationalmortgagenews.com/news/mortgage-applications-drop-although-rates-fell-to-10-month-low), which could make it an opportune time to buy. Overall, it’s a solid start to the year. As always, we look forward to answering any questions you may have on the La Plata County real estate market. In the next couple of months, we will be approaching the spring selling season, which tends to be one of the peak activity times throughout the year. Also, we will be hosting an open house at 157 Sierra Vista on Saturday from 1-3. We’d love you to stop by and say hello! The Durango Team has decades of real estate experience in the Durango, Colorado area. Let us help you buy or sell your Southwest Colorado home.